Written records trace the tomb sweeping ritual to the Spring and Autumn Period (春秋時代) around the 7th Century BCE. The legend tells of Charner (重耳), the prince of Jin Kingdom (晉), who was exiled for 19 years after a palace intrigue to assassinate him by his step-mother. During this period he would have starved to death but for the sacrificial act of Jie Zitui (介子推), who apparently cut off the flesh from his hip to feed the prince. After Chonger was restored to power, he sought out Jie Zitui to show his appreciation. But Jie Zitui and his mother had moved to a remote hill to become hermits. Unable to locate Jie Zitui, Chonger ordered the burning of the hill to force him out, but instead discovered that Jie Zitui and his mother had been burned to death. After this, Chonger banned fire burning and visited Jie Zitui’s tomb on the anniversary of his death. 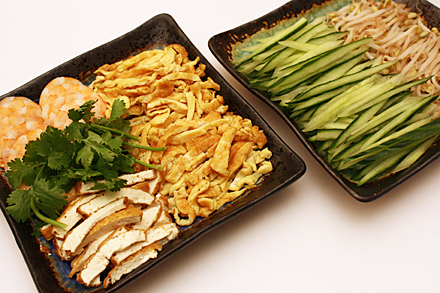 This custom continued and became known as the Hanshi Festival (寒食節) or Cold Food Festival. During the Tang and the Song Dynasties the Hanshi Festial was combined with Qingming celebration, which marks the beginning of the agricultural activities after a long winter. Qingming is one of the 24 solar terms in Asian lunisolar calendar that divides the year into 24 periods, and falls within a few day or two of Hanshi Festival. Although the name Hanshi was dropped its customs continue until the present day. Since fire is banned for the Qingming Festival, cold food predominates during the festival. This tradition remains with many regional celebrations of Qingming including the southern coastal areas of Fujian and Taiwan, where fresh spring rolls are standard fare. 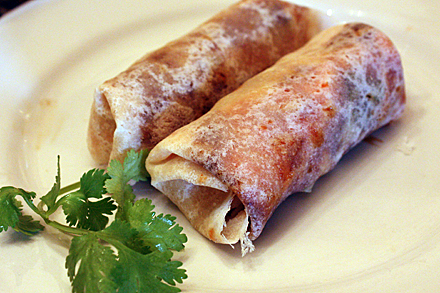 Thought to have descended from a similar roll dish from Central Plain, Fujian spring roll, or runbing (潤餅), is not deep-fried like its Cantonese cousin. 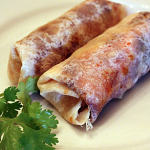 (In the Fujian dialect it is known as popiah.) The main filling is pork and cabbage made into a dry stew, which was then cooled to room temperature before being accompanied by all sorts of other ingredients including scrambled egg, shrimp, bean sprout, deep-fried tofu, ground peanuts and cilantro to be wrapped in the roll. 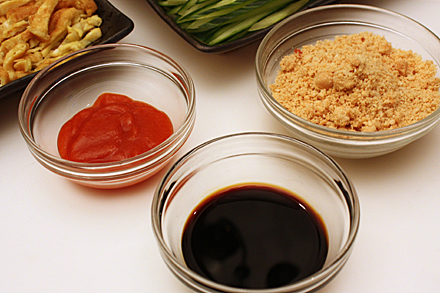 Sweet soy sauce and chili sauce are usually smeared on the wrapper before being rolled. The most important part of the Fujian spring roll is the wrapper. It is made by spreading a thin layer of wet but pliable dough made from flour and water over a flat warm iron to form a very thin pancake. The technique is very tricky and requires dexterity and regular practice to master. I consulted with Auria Abraham a few years ago on how to make this wrapper. Auria, who is from Malaysia, is a blogger and food entrepreneur marketing her wonderful spicy hot chili sambal to the adventurous foodies. Auria offered me her poh pia skin recipe, which is included below. I must admit that I have yet to master the making of this wrapper and am so envious when I observe Auria in the kitchen making them. Don’t despair if you’re unable to produce these thin wrappers at home. It is possible to purchase them in many Chinatown or Asian markets. They are round, thin and irregular-shaped wrappers found in the freezer section. Be sure not to confuse them with the more common square commercial Cantonese spring roll wrappers. Being far away from your ancestral home should not prevent you from getting together with your nearby relatives and enjoying a meal of Fujian spring rolls. Take a little time before the meal to remember your ancestors and celebrate the festival. I’m not sure if I would recommend hiring someone to go to the tomb however. 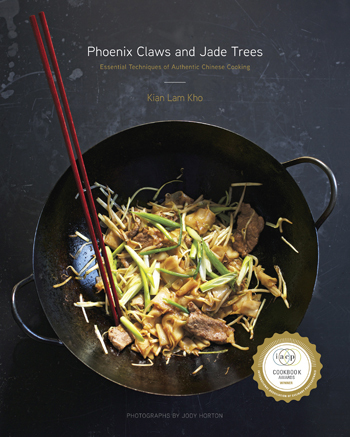 Heat a wok over high heat until a droplet of water sizzles and evaporates immediately upon contact. Swirl 1 tablespoon of vegetable oil around the bottom and sides of the wok to coat it evenly. Add the shallot to the wok and stir-fry until fragrant, about 30 seconds. Add the pork and continue to stir-fry until the meat is cooked through, about 3 minutes. Add the wine and water to the wok and turn the heat to medium. Cover the wok and cook the pork until tender, about 30 minutes. 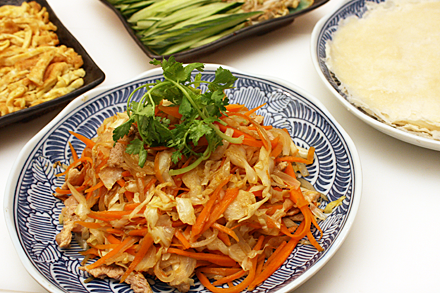 Add the cabbage, carrots and bamboo shoots to the wok and continue to cook until the vegetables are tender, about 15 minutes. Add the salt and pepper, then remove the filling from the wok and place it in a shallow bowl and let cool to room temperature. Whisk the eggs together with the salt in a small bowl. Heat 1 tablespoon vegetable oil in a frying pan until just about to smoke. 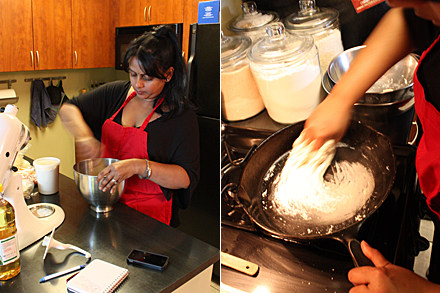 Pour the egg into the frying pan and swirl the egg around to completely coat the frying pan. Cook the egg for about two minutes over medium heat. Flip the egg and cook the other side for another two minutes. Let the egg cool and then julienne the egg sheet into thin 2-inch long strips. Prepare all the other filling ingredients and let cool to room temperature. 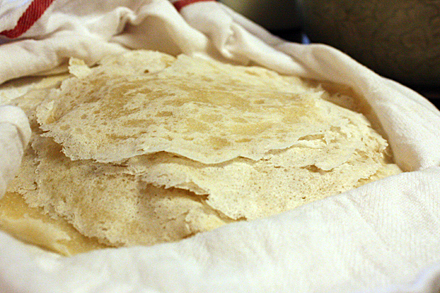 Make the wrapper by sifting the flour with the tapioca starch and salt. Add the vegetable oil and water, and knead until elastic and smooth. Heat a non-stick 12-inch frying pan over low heat until warm or about 200 degrees F. Use your hand to scoop about 1 cup of the dough and smear the frying pan with a very thin layer of the dough. Cook the dough for about 1 minute then remove with a spatula. Repeat for the rest of the dough. Serve the filling in a bowl and all the other ingredients and the sauces in small plates or bowls. Serve the wrapper separately on a plate covered with a damp towel or sealed in plastic wrap. 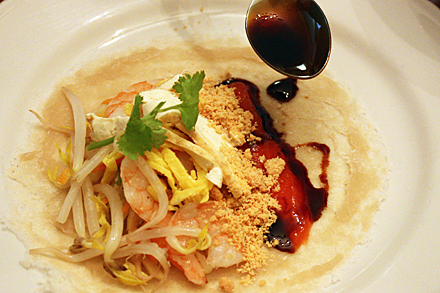 The diners make their own spring rolls by placing the filling along with their choice of other ingredients and sauce in the center of a wrapper. Then they roll the wrapper around the filling and eat it with their fingers. We especially love the rest of the post though, with the wonderful insight to the Chinese tradition with the tomb sweeping. It’s so great reading about other people’s culture and heritage.